Great Lakes Schooner Company and Cruise Toronto is offering you the opportunity to experience Toronto’s vibrant harbourfront and stunning views of Toronto’s beautiful skyline. 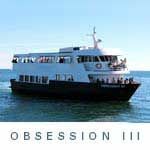 If you’re looking for delicious food, fabulous entertainment and stunning views, a Weekend Brunch Cruise or Dinner Cruise aboard Obsession III is the perfect cruise for you. Depending on the cruise you select, you get to enjoy either a contemporary sit down dinner or a freshly prepared buffet. While enjoying a first class meal, prepared by our on board chefs and only using the freshest local ingredients, you will also get to enjoy the breath-taking views of Toronto’s skyline, Toronto Islands and Lake Ontario. Obsession III is fitted with a fully retractable roof to suit all weather types and full wait staff to ensure the highest quality of service is delivered to our guests. On your dinner and weekend brunch cruise options, purchase a glass of wine, beer or cocktail from our specifically selected drinks list, allow us to capture memories with our on-board photographer and dance the night away under the stars with our professional entertainment. Our Weekend Brunch cruises are the perfect way to get the family together to enjoy excellent food, scenic views and a great atmosphere. Get 30% off when you book a group of 20 or more! Prices are subject to tax, admin fee and service charge.